NOW LEASING BRAND NEW SUPERVISED INDEPENDENT LIVING APARTMENT HOMES! 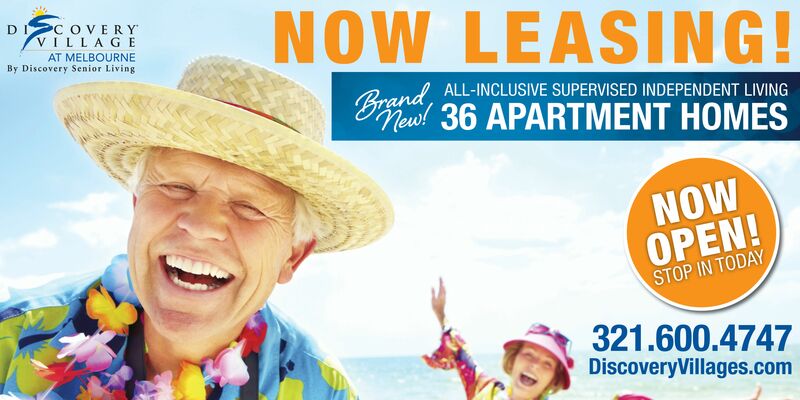 Discovery Village At Melbourne is thrilled to announce that the addition of 36 brand-new, luxury Senior Independent Living apartment homes are NOW OPEN. We can’t wait to show you what we’ve added to our already spectacular lineup of lifestyle options. CALL TODAY to schedule your tour. Our new units are filling up fast, but we still have availability on select apartment homes!. Call us today or click on the link to find out more! 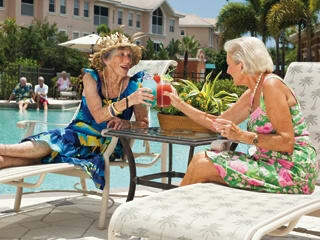 Welcome to Discovery Village At Melbourne, a world-class senior living community located in the "Harbor City". Strategically placed on US1 just across from the Indian River, just minutes away from Pinehurst Gardens and Harbor City Country Club Estates. Elevating senior living to a new standard, Discovery Village At Melbourne's lifestyle benefits are second to none, equally matching the grace and luxury of its sprawling community. Our state-of-the-art community features three distinct living options; Supervised Independent Living, Assisted Living, and Memory Care, our secured dementia and Alzheimer’s community. Discovery Village's resort lifestyle offers a unique approach to retirement living in that we provide the care, services and activities that residents need now or may need in the future all in one place. Our on-site Executive Director leads a team of specially trained health and wellness professionals delivering the personalized care plans that help you live smarter and healthier. 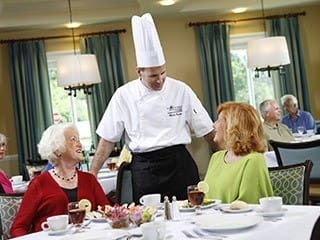 Plus, all the comforts and happiness of resort-style amenities like chef-prepared meals served restaurant style in one of two dining rooms daily, a full-time activities director and full calendar of events, concierge services, housekeeping, complimentary transportation and much more. From the elegantly appointed Grande Clubhouse to the luxurious apartment homes featuring granite countertops, elegant wood cabinets, upgraded appliances, designer flooring, walk-in closets and patios per plan, an emergency call system and more, the entire portfolio of exceptional living can be yours at Discovery Village At Melbourne. Please call us today to schedule your private tour. This is the community you or your loved one have been waiting for! 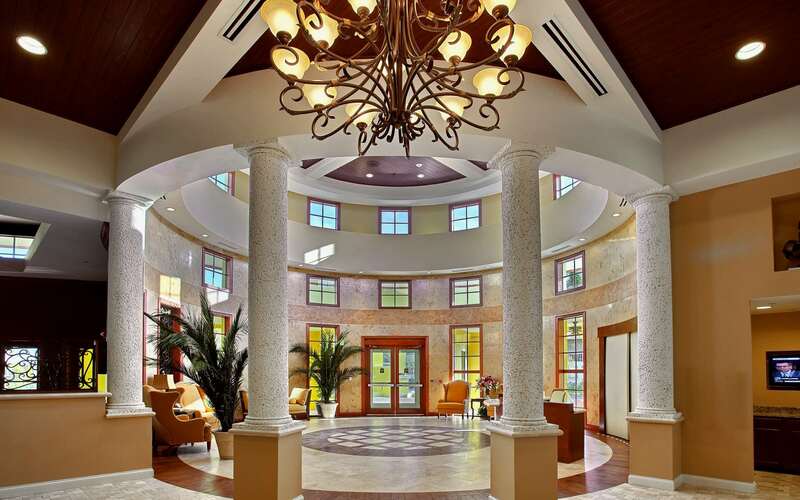 Discovery Village At Melbourne is managed and operated by Discovery Senior Living, a recognized leader for more than 25 years in the development, building, operation and management of affordable, award-winning senior-living communities. Our vision from the very beginning was to create beautiful communities where residents would find interesting and active friends engaged in a happy and healthy lifestyle. This vision has come to life through the dedication and loyalty of our team members. These professionals are committed to ensuring resident's experiences, satisfaction and enjoyment are unsurpassed each and every day. We are honored to serve our residents and are committed to maintaining the highest levels of personal care.